Marek S. Wartak received an MEng in Electronics (Electrical Engineering) with concentration on Solid State Technology and a PhD in Theoretical Physics with emphasis on Quantum Liquids, both from Wroclaw University of Technology, Poland. 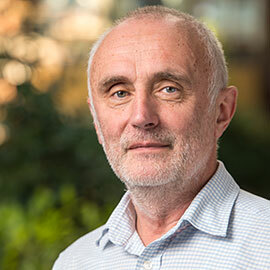 Wartak has over 30 years of experience in semiconductor physics, photonics and optoelectronics, analytical methods, modeling and computer-aided design (CAD) tools. During his career, he has worked at Nortel Networks and the National Research Council His work has taken him to Canada, California and Europe. Since 1990, he has been employed by Wilfrid Laurier University, presently as full professor at the Department of Physics and Computer Science, also an adjunct professor at Physics Department, University of Waterloo and a member of Guelph Waterloo Physics Institute, all in Ontario, Canada. Non-equilibrium Green's functions (NEGF) modelling of active photonic devices. Optical properties of various heterostructure compounds. Transmission-line method description of semiconductor lasers. Vertical cavity surface emitting lasers (VCSEL). Dynamical processes in solar cells. Compensation of losses in metamaterials. Wilfrid Laurier University Merit Award for 2003 2004 Academic Year. Wilfrid Laurier University Merit Award for 2012 2013 Academic Year. I have research assistantships opportunities for undergraduate and graduate students interested in simulations of photonic devices. Some other research areas can also be considered like, metamaterials, active plasmonics, nanostructures and optical properties of semiconductor heterostructures. Please contact me for more information. M.S. Wartak, “Computational Photonics. An Introduction with MATLAB”, Cambridge University Press, Cambridge 2013. M.S. Wartak, “Nanolasers”, in Handbook of Nanophysics. Nanoelectronics and Nanophotonics, Klaus D. Sattler (Editor), 39, pp.1-14, CRC Press, Taylor & Francis Group (2011). M.S. Wartak, “Optical gain in InGaAsN quantum well structures. Summary of various approaches”, in Quantum Wells: Theory, Fabrication and Applications, Editors: Alfred Ruyter and Harper O'Mahoney, pp.249-280, Nova Science Publishers, May 2010. M.S. Wartak and P. Weetman, “Advanced modeling and simulations of quantum well based semiconductor lasers”, Handbook of Semiconductor Nanostructures and Nanodevices, v. 4, pp.409-455, edited by A.A. Balandin and K. L. Wang, American Scientific Publishers, Los Angeles (2006). A. Fedoseyev, M. Turowski, M.S. Wartak, “Kinetic and quantum models in simulation of modern nanoscale devices”, in Handbook of Semiconductor Nanostructures and Nanodevices, v.3, pp.447-482, edited by A.A. Balandin and K. L. Wang, American Scientific Publishers, Los Angeles (2006). M. Gladysiewicz, R. Kudrawiec, M.S. Wartak, “Theoretical studies of optical gain tuning by hydrostatic pressure in GaInNAs/GaAs quantum wells”, J. Appl. Phys.115, 33515 (2014). J. M. Miloszewski, M.S. Wartak, S.G. Wallace and S. Fafard, “Theoretical investigation of carrier capture and escape processes in cylindrical quantum dots”, J. Appl. Phys. 114, 154311 (2013). M. Gladysiewicz, R. Kudrawiec, J. Miloszewski, P. Weetman, J. Misiewicz, M.S. Wartak, “Band structure and the optical gain of GaInNAs/GaAs quantum wells modeled within with 10-band and 8-band kp model”, J. Appl. Phys. 113, 063514 (2013). J. M. Miloszewski and M.S. Wartak, “Semiconductor laser simulations using non-equilibrium Greens functions”, J. Appl. Phys.111, 053104 (2012). J.M. Miloszewski and M.S. Wartak, “One dimensional model of semiconductor laser based on quantum well using non-equilibrium Green’s functions method”, AIP Conf. Proc. 1368, 121-124 (2011). M.S. Wartak, K. L. Tsakmakidis and O. Hess, “Introduction to metamaterials”, Physics in Canada 67, 30-34 (2011). K. L. Tsakmakidis, M.S. Wartak, J.J.H. Cook, J.M. Hamm and O. Hess, “Negative-permeability electromagnetically induced transparent and magnetically-active metamaterials”, Phys. Rev. B 81, 195128, 2010. J.M. Miloszewski, M.S. Wartak, P. Weetman and O. Hess, “Analysis of linewidth enhancement factor for quantum well structures based on InGaAsN/GaAs material system”, J. Appl. Phys., 106, 063102 (2009). Thursdays, 11 a.m. to noon.